We’ll get straight to it: we have a full on love affair with Troy Lighting. Their eclectic collections of artisan made lighting fixtures are absolutely gorgeous, and if you’re looking for something that will really make a statement in your room, this is the line to check out. Troy Lighting takes a classic approach to decors top trends, so you get a fixture that is somehow both timeless and of the moment. We’ve chosen 10 of our favourite pieces to highlight in today’s post, but this is just the tip of the iceberg. Shop their full line here. We love this modern take on a traditional style chandelier. It adds the perfect depth and weight to this otherwise bright and contemporary design from House Seven Design. Shop the Sawyer collection here. 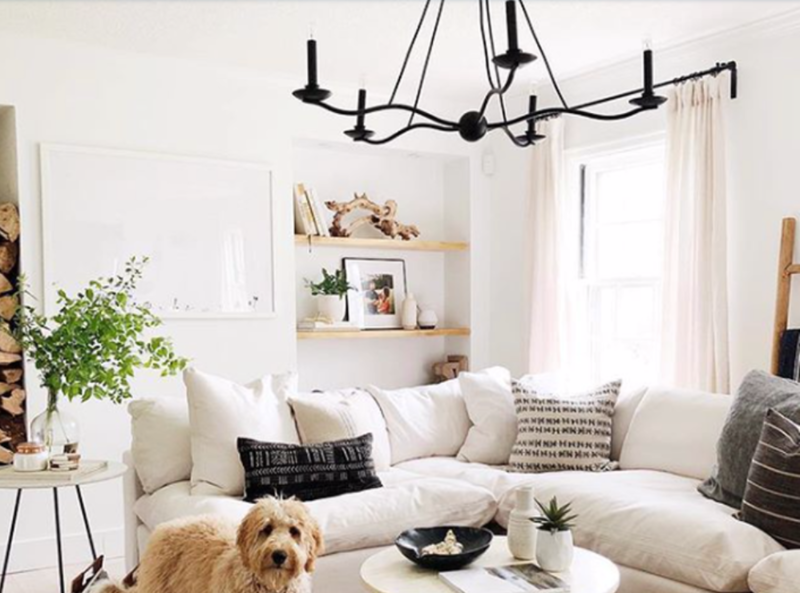 We featured the beautiful Hideaway fixture in our minimal light fixture roundup, and it continues to be one of our favourites. It gives the perfect subtle detailing to this clean, minimalist space by Kristina Lynne Tracey (photos by Jazmine Photography). Shop the Hideaway collection here. Add the perfect pop of cool to your exterior decor with the stylish Alleghney wall mount. It’s perfection here on the California-cool porch, styled by SF Girl By Bay. Shop the Allegheny collection here. The smoked glass trend made it into our 2019 Lighting Trend Forecast, and it’s never looked better than in the Odyssey chandelier. It looks stunning in any room, and we love it as a dining light in Sophia Chang’s home. Shop the Odyssey collection here. The Stix fixture from Troy manages to combine rustic with chic, making this fixture work anywhere from a log cabin to a penthouse. Shop the Stix collection here. The Bastille chandelier is available both in this rectangular as well as a circular shape. It’s a gorgeous solid piece that is show stopping in an open space. Shop the Bastille collection here. Of all of Troy’s fixtures, this is probably the one we’re asked about the most- and it is very easy to see why! Shop the Raef collection here. The District pendant is available in three gorgeous glass shades. They look stunning on there own (as pictured here in Kresswell Interiors’ design), and even better all together. (photo: Tracey Jazmine Photography). Shop the District collection here. We don’t know which we love more- the Alchemy pendant or the matching wall sconce. Luckily, you don’t have to choose between the two! They look great together. Shop the Alchemy collection here. We always love a good geometric fixture, and the Silhouette nails the look with its balance of detail and simplicity. Shop the Silhouette collection here.